The 3.25 oz. swirl salt / pepper shaker features a whimsical swirl-glass pattern and brilliant metal top. It’s great for filling with your choice of salt or pepper, or for using with cocoa powder, nutmeg, and any other flavorful spice! Use it in your dining room for table service, or place it at your self-service station for a quick, on-the-go seasoning. The Cheese shaker is multi purpose and in addition to dispensing parmesan cheese, can be used for confectioners powdered sugar, crushed red pepper flakes, chocolate, popcorn salt or any other spices or uses you can think of! The Sugar Shaker is perfect for serving sugar with coffee or tea, baking, and tabletop service. Serve your guests in style with this beautiful and functional dispenser set, the perfect addition to any table. Classic crystal glass swirl design Salt and Pepper shakers have screw on stainless steel metal lids and hold 3.25 oz of salt, pepper, or any other spice. 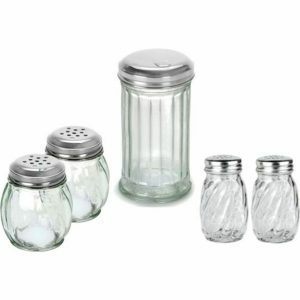 The Grated Cheese shaker is ideal for both commercial and home settings for dispensing parmesan cheese, pepper flakes, powdered sugar and other seasonings through larger easy screw-on top, over a attractive swirl design bulb jar. The screw top lid seals tightly, so you can top your pasta and pizza with Parmesan cheese without worrying about spills or messes; 3 inch diameter x 3.5 inch height, with a 6 oz capacity. Flip cap Sugar Dispenser is made from glass with a diner style brushed metal dispensing lid for easy pouring; 3 inch diameter and 5.5 inch height, with 12 oz capacity. All items are dishwasher safe and made with high quality glass.